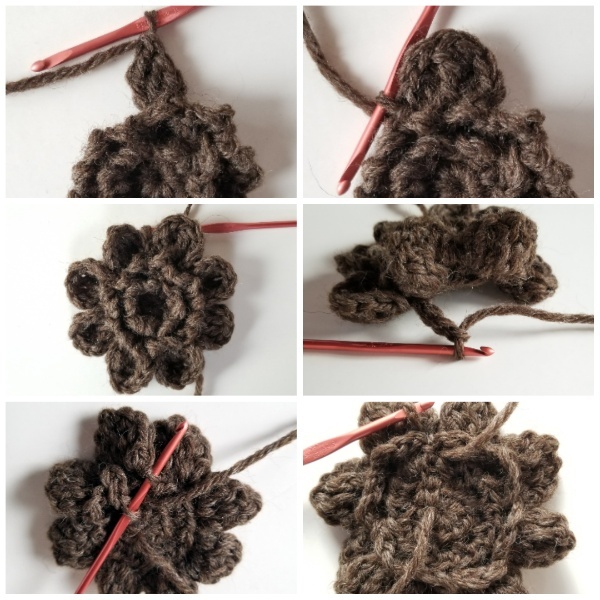 What’s this about the “knit stitch” in a crochet pattern? Friends, if you have ever wanted to achieve the look of knit, without picking up two needles (eg. you want to “knit” with your crochet hook), stick with me because that’s just what we’re going to be doing this week! 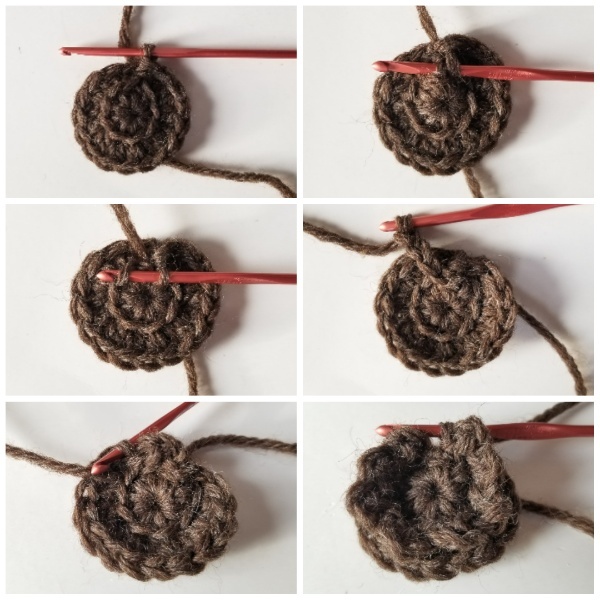 We’re almost done with February, but it’s not too late to learn a new skill in the New Year, and that’s just what we’re going to do today as part of the New Year, New Skill Crochet-A-Long. If you’re just now learning about this fun event, head on over to Underground Crafter to see what skills you missed in the first half of the event, or visit the CAL Central Facebook group, and stay tuned because there are still 4 more weeks (and 3 more skills) left before the event is over and a winner is chosen! 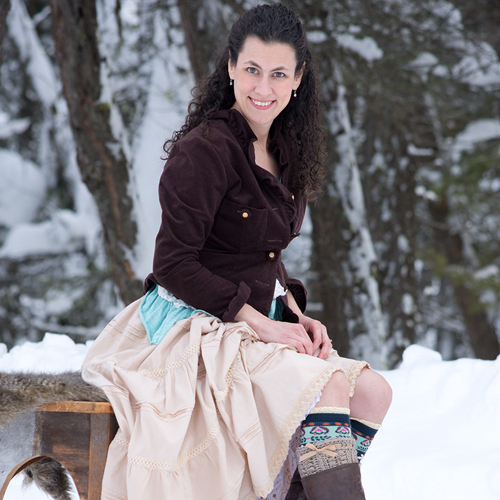 …And what if you already know how to do the skills and stitches taught in this event? Congratulations! You’re still eligible for the prizes as long as you make the items, and enter pictures of them over here. We love celebrating crocheters of all skills and abilities! Let’s get started on this week’s project, shall we? 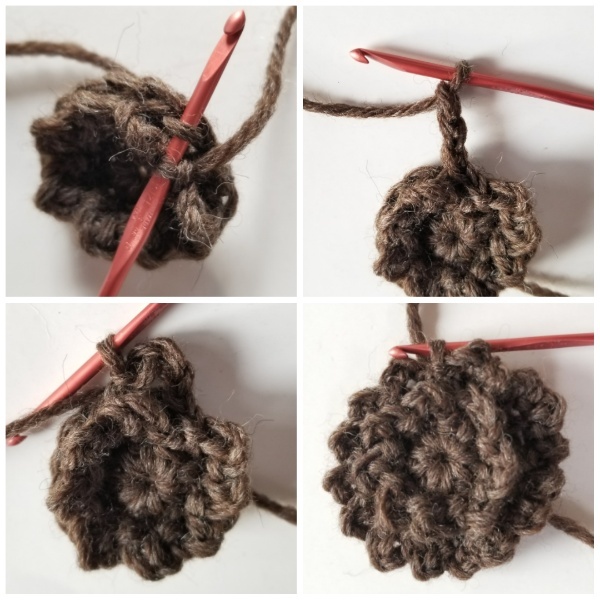 I chose to teach you the crochet “knit stitch”, also called the “crochet waistcoat stitch”, or center single crochet, because I love the look of knit fabric, but my knitting skills run quite a bit behind my crochet skills. 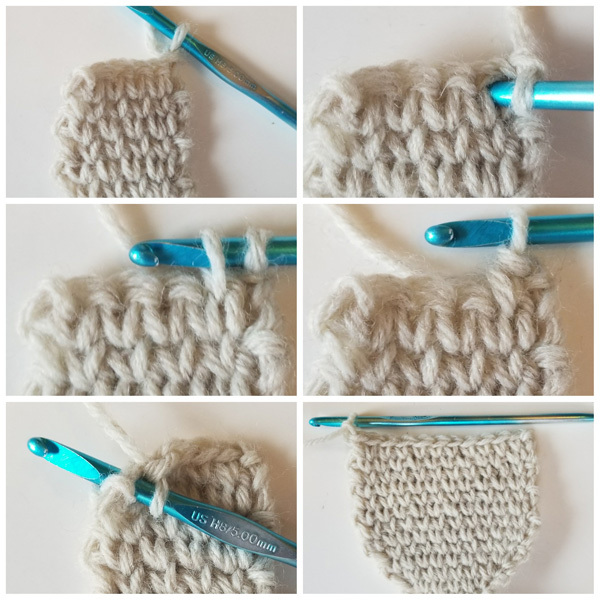 The crochet “knit stitch” provides a workable solution to this dilemma, and is great for headbands, bags, and purses, or any project that needs a thicker more durable fabric. I should also note that when worked in the round, it truly does take on the appearance of knit fabric, much more so than it does in rows, but hopefully you will still enjoy this project. For headband: 7 stitches in 2 inches. Gauge is unimportant for flower. Loose tension is a MUST for this project. 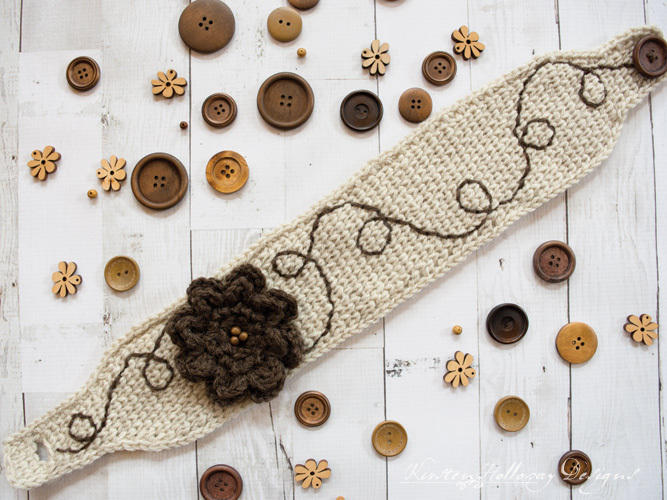 Because this headband is worked in rows, you can make it as long or short as you like. Remember this headband is NOT a toy, and you may want to leave the small wooden beads off the flower if you plan on making this for a child. The first picture at the top left shows the row before any stitches are worked into it. Picture 2 at the top right shows where to insert your hook. You will see what look like upside down v’s. Insert your hook between those upside down v’s, and sc as normal. The picture on the left in the middle row shows drawing up a loop, and the picture next to that shows the completed stitch. The bottom left picture shows the last stitch of the row being worked into the final stitch, as one normally would, and the bottom right picture shows what the fabric looks like after increasing, and doing several row repeats. Keep scrolling down for a short video tutorial. Repeat row 14 until your band is about 4-6” inches shorter than the head circumference of the person you are making it for, then begin decrease rows. I crochet very loosely and did a total of 72 rows before decreasing. Note: Final sc2tog of each row will be worked in the center of the second to last stitch, and in the last stitch as normal. 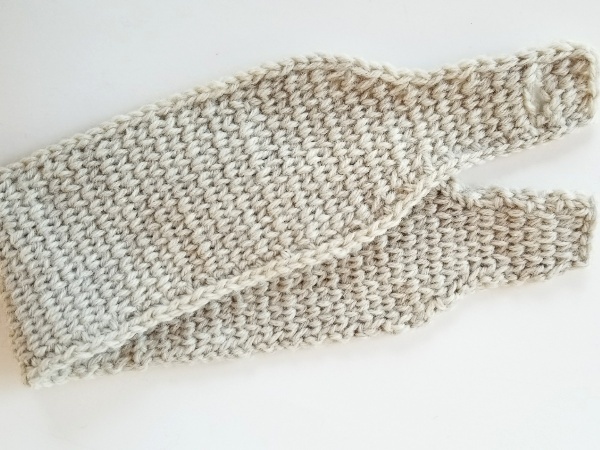 Slip stitch loosely around the edge of the headband. Go up a hook size or two if you have tight tension. Your headband should still be very stretchy when you finish this step. Fasten off and weave in ends. Note: I ended up weaving in one of my ends near the button hole to reinforce it a little more. Flip headband over so you are working on the back side. 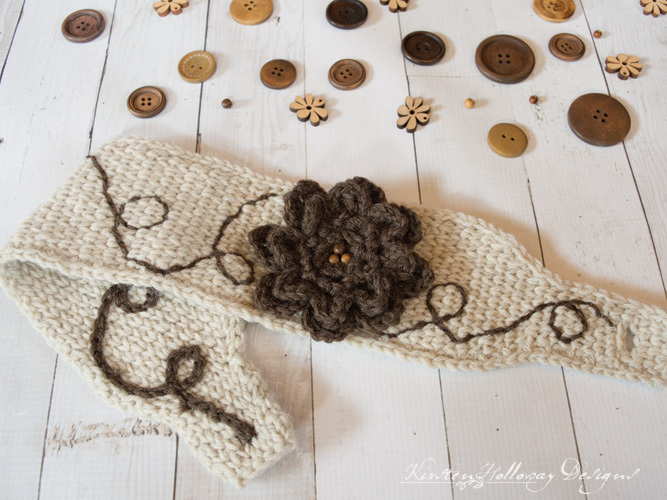 Attach brown yarn to one end of headband, and slip stitch a simple swirl pattern from one end of the band to the other. 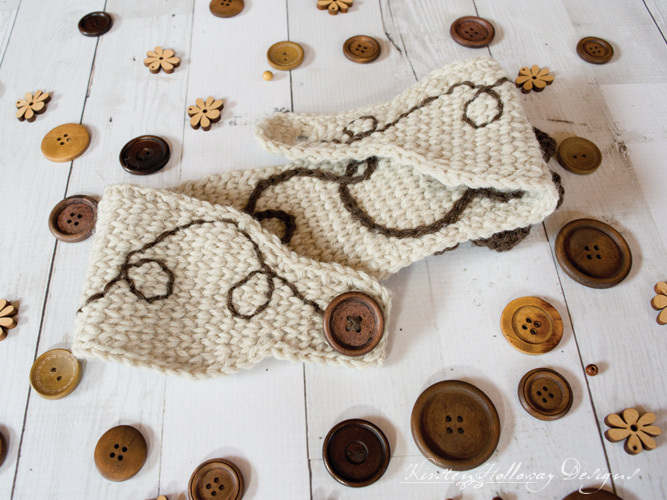 You will need to check the front every few stitches to make sure your swirls are looking the way you want them to. If you are familiar with cross-stitch, you may try doing the back stitch instead. It may be faster and easier. 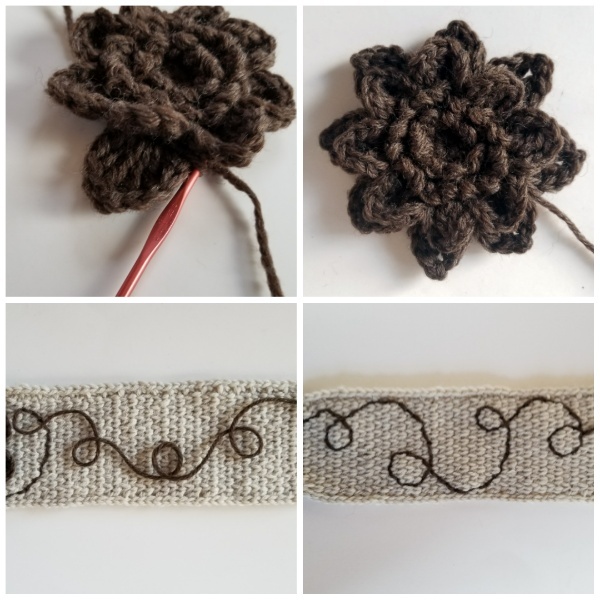 Another tip that may help: I laid out my yarn in a swirly pattern on the headband, then took a picture, and used that as a guide for how I wanted my swirls to look. Keep scrolling down for additional finishing instructions if you don’t need the picture tutorial. 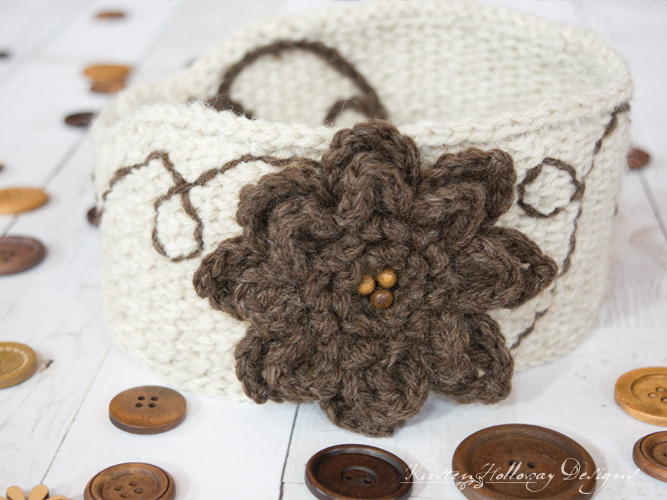 (Optional) Take 3 small wooden beads and sew them securely into the center of the flower. And for more crochet fun, check out my Facebook group! This post may contain affiliate links. When you purchase something using these links a small amount of the sales price goes to me to help keep this site, and the patterns on it free. You do not pay any extra for the item you purchase. How cool is that?! Very pretty pattern and love the pictorial. Thank you, Heather! I’m glad it was helpful! This is a wonderful pattern absolutely enjoyed making it. Thank you Joan! I’m so glad you liked it!